Vladimir Putin has congratulated Valentina Tereshkova on her 80th anniversary. Russian President Vladimir Putin has congratulated the first woman in space Valentina Tereshkova on her 80th anniversary. 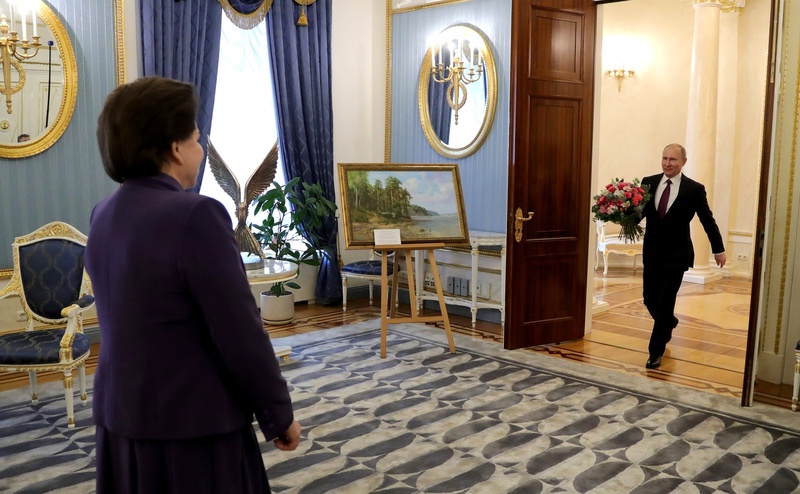 Putin presented her with a bronze sculpture by Iulian Rukavishnikov dubbed "Gull Landing on the Water" and a painting by Vitaly Zaitsev named "Gulls above the Volga". Thus Putin referred to the legendary famous call sign - Chaika (or gull) - that Tereshkova used during her space flight in 1963. "Dear Valentina Vladimirovna, allow me to offer you my sincere and wholehearted greetings to you on your anniversary," the president began. "I have two presents for you. This is, actually, your call sign. And a wonderful, beautiful painting named "Gulls above the Volga", in fact, it is a picture of your native region." Tereskova responded by saying that she was very touched by the gift. Putin also thanked her for serving the country. "Starting from you legendary space flight, you have always set a good example for us and have always been a symbol of service to the country - in various places and in various positions - and now you continue to work at the State Duma," the Russian leader said. "I know how much you love our great Homeland, Russia, as well as your native Yaroslavl region, you always care for it, always mention it whenever we meet. This is what your strength is based on - you cordial affection for the Homeland," Putin noted.